The planning application for the redevelopment of the site of the Blue Goose pub on Lanark Road, Edinburgh has now been received by Edinburgh Council. 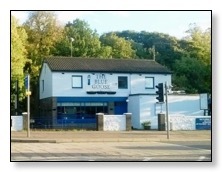 More information on our campaign to save the Blue Goose can be found on our Campaigns page. 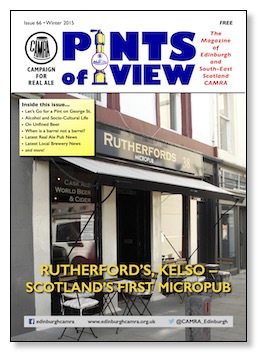 The Winter 2015 issue of Pints of View will be appearing shortly in real ale pubs throughout the branch area. This issue includes all the regular pub and brewery news, plus features on the pubs of George Street, unfined beer and cask sizes. Look out for a copy in a pub near you. A PDF copy will also be available from the Publications page soon. Erratum: The Plough Inn mentioned on page 17 is in fact in Leitholm, not Yetholm. Apologies for the confusion. Pubs have now been selected for the inaugural annual CAMRA Edinburgh & SE Scotland Real Ale Quality Award. This is awarded to the pubs that have the highest average beer score during the year. Beer scores are submitted by CAMRA members as they drink in pubs. They range from 0 (undrinkable) to 5 (absolutely stunning!). To qualify the pub must have received at least 10 scores on at least 5 different days from at least 5 members.